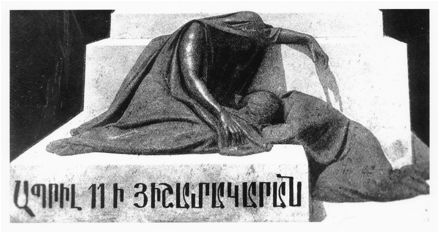 The Monument Shown on the Cover of Teodig�s 1919 Book Entitled Hushartsan Abril Dasnamegi [Memorial April 11]: A closer look at a beautiful monument and a plea for a serious effort to learn more about it. There is an activity that has come to be known as �Dark Tourism.� This is perhaps best viewed as a form of pilgrimage tourism wherein a site or commemorative reminder of a catastrophe, disaster or tragedy no matter how great or small, is the focus. In Istanbul, had we known of it when we made our first visit many years ago, we might have been in a position to make an effort to �see� �delve into� something tangible, concrete such as an exact physical site, symbolic marker, iconic monument, anything associated with the Turkish genocide against the Armenians that began in 1915. This would have been before many of the structural changes in the development of the city had taken place. Such an attempt at �dark tourism� might well not have led anywhere because we had no access to any special guidebook or information that would have been especially significant for Armenians interested in such gloomy matters, but we could have tried. Would that there had been a booklet, or even a list, detailed or otherwise. One can only hope today that there might be one available in the future for those interested in �dark tourism.�. Too little, too late? (See endnote just before the Bibliography). The well-known journalist, writer, almanacist Teodoros Lapchindjian (1873-1929) writing under the pen name Teodig (Teodik) published in 1919 in �G�Bolis� [Constantinople. Arzuman printing house] a small volume, 129 pages in length, 26 cm or 10.2 inches in height with a very appropriately illustrated cover. The volume was devoted to the many Martyr�s of April 11/24, 1915. (We will not go into detail here about the exact number of martyrs covered by Teotig, some 763 from a broad area, because it would require more than a little space to do that justice.) The original work seems nowadays to be quite rare and is apparently held only by a few libraries in the world. We have ourselves never seen a copy complete with cover but happily a bilingual version of Teotig�s Memorial April 11 is available due to the work of Dr. Dora Sakayan and publisher Deniz Zarakolu (son of the pioneer Turkish human rights activists, writers and publishers Ragip Zarakolu and his wife the late Ayşe Nur Zarakolu) and others who participated and exercised their talents in producing the translations etc. for the volume. The soft cover book, 24 cm high x 14.5 cm. wide, comprises 269 numbered pages with 6 additional pages at the end. It was published back in 2010 and has 70 pages of detailed and very interesting introductory material. To risk raising eyebrows by using a double negative, the cover of the new publication is not unattractive, but it seems not to convey any particular message that we could discern, neither does it elicit any special emotion. It shows a wall with a Virginia creeper-like vine with a few berries on it. It might well take some special knowledge or insight that we do not have to interpret its selection and use. The �new� volume is constituted of facing pages - on the left hand side is the text in Armenian complete with a circular bust photograph of the martyred person in question, and on the right, the Turkish translation - minus the photograph (which would be redundant, of course). This publication in Armenian and in Turkish was published by the Zarakolu-owned and -operated (and all-too-frequently harassed by the Turkish authorities-) Belge Publishing House in Istanbul. 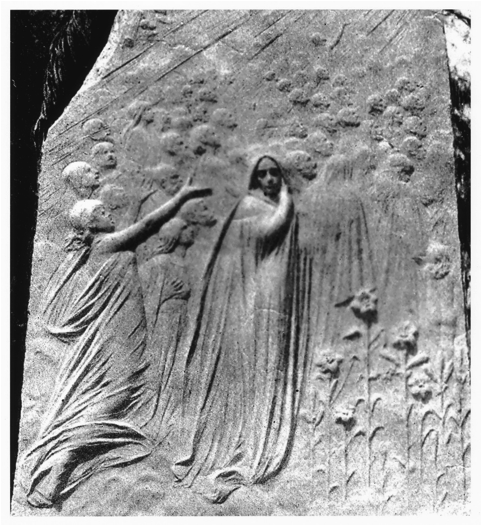 As our title intimates, the purpose of this brief communication is to call attention yet again, for it has been known about by some at least, to a stone monument dedicated in 1919 to the Armenians who were arrested in Constantinople at the outset of the genocide, and many others who were martyred in that fateful period. 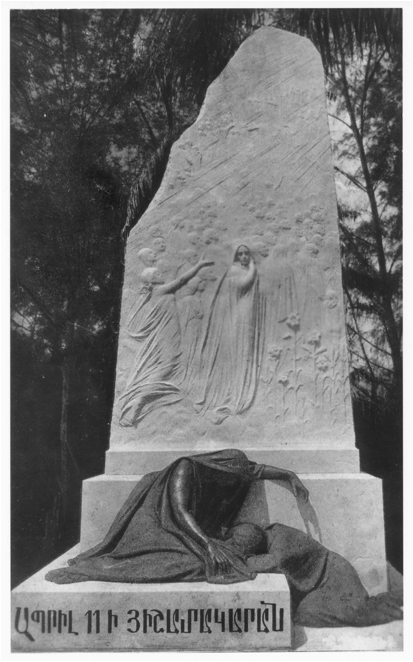 There is a full page photographic illustration of the monument in the 2010 expanded re-issue. It follows page lxx (pg.70) and was taken from the cover of a copy of the original version of Teodig�s Hushartsan Abril Dasnamegi memorial. Owing no doubt to the limited quality of what the Zarakolu publishers had to work with, and the non-glossy paper used throughout, the reproduction is not of the very best quality and shows, of course, only the front of the memorial. 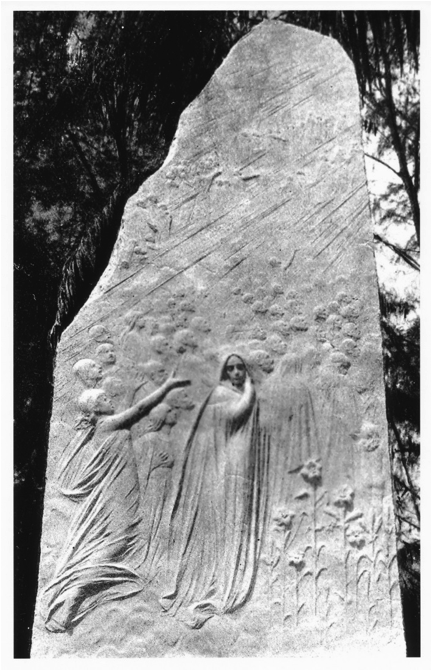 There is nothing evident from the photograph as to who might have executed the work, or even if the monument was free-standing or was on a pedestal of some sort. The monument appears for sure to be in a garden or park or similar area (perhaps a cemetery? see below) because there are plants and other �greenery� apparent in the black and white image. We hope viewers will agree with us that this is a very beautiful monument. (A partial listing and views of some memorials to the Armenian Genocide may be found for example at http://www.armenian-genocide.org/memorials.html; or at http://en.wikipedia.org/wiki/List_of_Armenian_Genocide_memorials#mediaviewer/File:ErmeniSoykirimAniti.jpg). We need not devote much space here enumerating the immediately obvious and relevant questions. Is the Monument really lost? Was it destroyed? Can anything be found in the Press of the period, anywhere, concerning this monument such as its dedication etc.? What was it made of? Who executed it? What were its dimensions? Was anything on the so-called recto or backside? Was there a religious memorial service, a belated Hokehankist for the Repose of Souls, upon any formal dedication that may have taken place? If the entire monument or any part of it such as the �pedestal� still exists, is there any chance of locating it/them? (Some have posited on the Internet that it has been located but there seems to be no confirmation of that and thus for us it remains a conjecture.) No mention of the said Teotig volume is to be found in Pars Tuglaci�s monumental work (see citation in the select bibliography). The card is in a private collection, namely that of P.E. Apkarian. It is through the owner�s kindness that we were allowed to make a scan in the first place, and secondly, that we have been permitted to show it here. Undoubtedly these views will sadden, even frustrate and anger anyone who studies and contemplates the Memorial. Of course, all this underscores yet again the �transgenerational trauma� that many with Armenian connections feel when viewing such images (see Kupelian, Kalayjian, Kassabian reference below). A view of the front of the post card is shown below. Enlargements follow, all are courtesy of the P.E. Apkarian Collection. 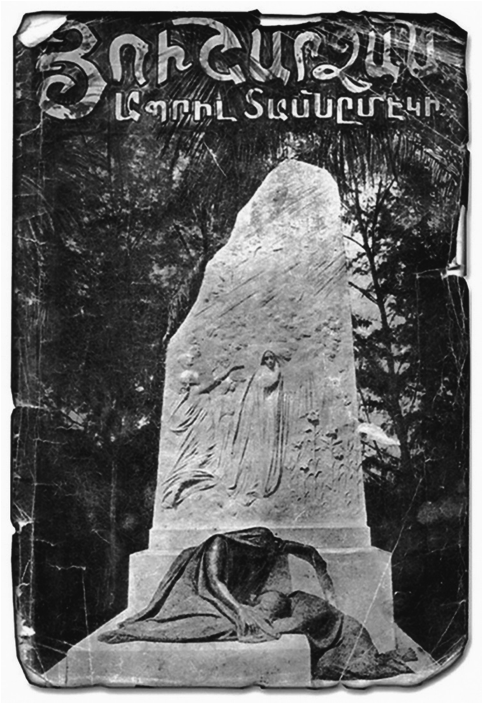 Significantly, the �pedestal� of the memorial stone referred to in the Zarakolu preface is not shown on the cover of the book (see above) but is on the post card. We will refrain here from making comments on the symbolism of the art work. The haunting question may again be asked:- �What are the chances of uncovering additional reliable information?� We hope that we shall obtain more information before too long. This is surely an exceptionally worthy project of discovery for someone or some group to undertake. As an aside, we were reminded by our friend Matthias Bj�rnlund in Copenhagen that the site of the 20 gallows for hanging the Hunchagians is still there but we did not know back then that this infamous event which took place on June 15, 1915 was in Sultan Bayazit Square. Since then, in the course of our studies on imagery we have cast a wide enough net on available pictures and photographs to learn much about the �20 hanged — ksan gaghvahdzneruh.� ADK remembers that Hokehankist for them was an annual special service at the Church of Our Saviour in Worcester, Massachusetts. We should at least think about posting something on that topic one of these days. Ben-Amos, Dan and Liliane Weissberg, editors (1999) Cultural memory and the construction of identity. 333 pgs., Detroit: Wayne State University Press. Carrier, Peter (2005) Holocaust monuments and national memory cultures in France and in Germany since 1989; its origins and political function of the Vl d�Hiv in Paris and the Holocaust Monument in Berlin. 267 pgs., New York: Berghahn Books. Kupelian, Diane, Anie Sanentz Kalayjian and Alice Kassabian (1998) The Turkish Genocide of the Armenians. In: Yael Danieli, ed. International Handbook of Multigenerational Legacies of Trauma, pgs. 191-210., New York: Plenum Press. Kuyumjian, Rita Soulahian (2010) Teotig: Biography. viii, 243 pgs., London: Taderon Press, Gomidas Institute, Tekeyan Cultural Association. Lennon, J. John and Malcolm Foley (2000) Dark Tourism, the attraction of death and disaster. 184 pgs., London and New York: Continuum. Minas, Setrak Benjamin (1965) April 24 Armenian Memorial Day. Why Armenians commemorate this day. 8 pgs., A publication of the Commemorative Committee on the 50th anniversary of the Turkish massacres of the Armenians, 212 Stuart Street, Boston, Massachusetts. Shamtanchian, Mikayel (2007) The Fatal Night. An eyewitness account of the extermination of Armenian Intellectuals in 1915. Translated from the Armenian by Ishkhan Jinbashian. 67 pgs., Studio City, California: Hagop and Knar Manjikian Publications. Tuglaci, Pars (2004) Tarih boyunca Bati Ermenileri [Western Armenians throughout History] [Cilt, vol.] III (1891-1922) 876 pgs. Istanbul: Pars Yayin ve Tic Ltd. This beautifully illustrated and rich compendium of western Armenian history by a dedicated and widely traveled historian of Armenian heritage (born Parsegh Touglajian) shows no image of either the book cover of the title page or even the book in an otherwise rather detailed, and copiously documented coverage of the period, see especially the last 200 pages or so.